Ascension Day (“Sensa” in Venetian dialect) takes on particular significance in Venice, where, together with the Catholic celebration, the mystical union between Venice and the sea is celebrated every year on the second Sunday of May. It is a millennial celebration and, like almost all Venetian celebrations, it began as a secular celebration; not that religion did not have part in it but its origins were civil and political, and religion had only to consecrate the glories, the victories and the events. The first one is the naval victory by the Venetians over the pirates who infested the Adriatic coast. All cities of the Illyrian coast were often attacked by these bandits that leaved paths of destruction wherever they went. A delegation of those countries came therefore to ask the help of the Venetians. At that time the Doge was Pietro Orseolo II; he was an enterprising man, ready to seize every opportunity to extend the reputation and the power of the Republic. He sailed from Rialto on the Ascension Day; he reached the pirates in Kvarner, went in after them in the middle of that maze of reefs and islands that form the Illyrian Archipelago, and in a few weeks he freed those seas from those terrible massacres and robberies. Thus the victorious Doge triumphantly re-entered the city which was still called Rialto. The inhabitants of Dalmatia, grateful for the help received, made an act of devotion to the powerful Republic. This was the origin of the Venetian rule over the coast and the first step that Venice took out of its lagoon, the first step towards the East, which Venice dominated with trade and with weapons afterwards. All this happened in the year 997, just three years before the millennium that, according to the prophecies of the Church, would have brought the end of the world. However, it does not seem the Venetians believed in such a sinister omen: on that same year they established the celebratory feast of their victory. The second victory that is celebrated on the day of Sensa is a diplomatic victory. It was the year of the Lord 1177, on the Ascension Day. Venice was chosen as the venue for the conclusion of peace between the papacy and the empire. The Pope Alexander III, had fled from Rome following the threats made against him by the Emperor Frederick Barbarossa. After a long and bloody war between the two powers, a much desired reconciliation was finally reached. A congress was convened and, thanks to the diplomatic ability of the Doge Sebastiano Ziani, the choice of location fell on Venice; It was the first big summit of the history. The long discussions between the various opposing forces (Emperor, Comuni, Normans, Greeks) took place from May to June. On 24th July, 1177 the peace was signed. At the time of farewell from Venice, the pope, in a sign of gratitude to the government that had hosted at its own expenses the crucial event, filled the city of gifts and handed to the Doge Ziani a blessed ring, pledge – as stated in the papal bull – of the sovereignty that you and your successors will have perpetually on the sea, and a symbol to marry with the sea as a man takes in marriage his bride to be his lord. The generous and grateful pope added another prestigious concession: all the faithfuls who visited the Ducal Chapel and the Basilica of San Marco on the Ascension Day, would have plenary indulgence. Now that could be a lucrative business, on condition of being able to attract a large number of pilgrims! Thus the Sensa feast assumed even greater importance. Before 1177 it was a very simple ceremony but from then on they begun to celebrate the famous ritual of the Marriage to the sea: The Doge, on board the Bucintoro (the sumptuous State boat, rowed by the Arsenalotti) followed by a crowded procession of all types of boats, reached St. Helena, at San Pietro di Castello, where the Patriarch was waiting to give him the blessing, on board a boat with gilt sides. The Patriarch and the canons of the Ducal Chapel of Saint Mark intoned the usual prayers and the Doge pronounced aloud the formula of the rite, which was the following: Ut hoc mare nobis et omnibus in eo navigantibus tranquillum et quietum concedere digneris te rogamos, audi nos. Returning to Saint Marks, the Bucintoro solemnly announced the beginning of the Ascension fair, open to the trade of all countries. In the large quadrangle of Saint Marks’ Square, a double row of shops was set up symmetrically in a great ellipse from side to side. It was a sort of universal exposition of all the best art and industry that was produced at the time. You could admire products and manufactured goods not only from Venice, but also from any other part of Italy and Europe. The fair lasted fifteen days and during those days Venice was the store and the theater of the whole civilized world. Foreigners flocked there from all over the world. During the fifteen days of the fair it was allowed to wear a mask as during Carnival. The last marriage of the sea of ​​the Venetian Republic took place in 1796 under the Doge Ludovico Manin. After the fall of Venice all the celebrations ceased. 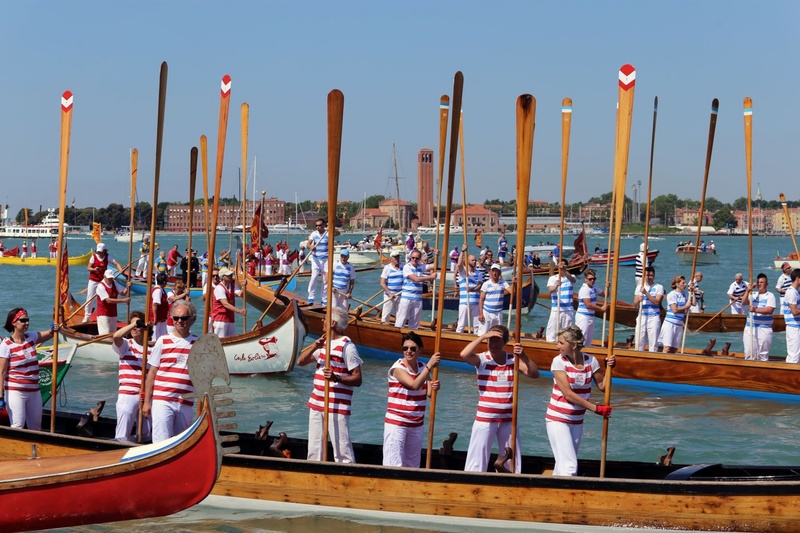 Thanks to the activities of the Committee of the Festa della Sensa, from 1965 Venice began to celebrate the event again with a water parade of traditional rowing boats from Saint Mark’s to the Lido organized by the Coordination Voga Rowing Clubs. 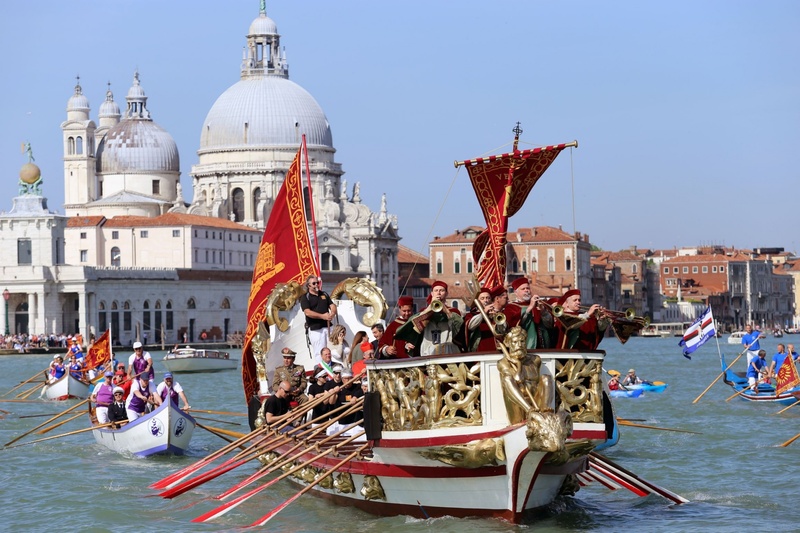 The Festival of the Sensa is still warmly celebrated by Venetians and is part of the city life. Nowadays in place of the doge, the major of Venice marries the sea off the harbor mouth of San Nicolò, using the same secular formula. On that day the promise to always protect Venice in good as in bad times is made. An indissoluble bond of mutual respect and love.